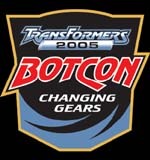 This year we had three Hasbro panels covering their Transformers toy products. 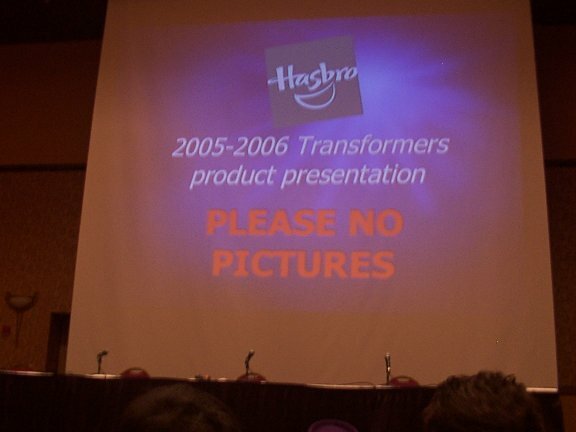 This one was mostly for unveiling their 2005-2006 toy products, and some would then be added to their display cases in the Dealer Room today (in the Hasbro Display page). Hosting it was Aaron Archer (Design) and Greg Lombard (Marketing).... and as the photo below says, there are no photos for this page, just my notes. First up, a Movie update. - Release date was announced at SDCC for July 4th 2007. - It is by Dreamworks & Paramount, with Steven Spielberg as Exectutive Producer and Michael Bay as Director. - The cartoon will be on Kids WB until the end of 2005, then on Cartoon Network for 2006. - Re-releasing early wave products by April next year. - Optimus Prime (new - Dodge Ram SRT 10) - May 2006 - slightly larger but same price point. - Each is recoloured to better resemble the cartoon, including allegiance symbols painted on them. Plus, late 2006 will see a new Deluxe Megatron & Optimus Primal. No other Beast Wars anniversary toys are planned beyond these. - Seacons (redeco set shown at the Rarities panel yesterday) - ready to go but still trying to find a store for them because of the effort put into finding and testing the moulds, as well as the recolouring, bio and packaging. - No continuity connection to either universe, they are just transforming Star Wars vehicles. - Showed Luke/X-wing, Darth Vader/ Tie Advanced, Droid tank/General Grevious, Jedi fighter/Obi Wan. & Boba Fett/Slave-1. A promo video was played, from SDCC, for the new movie... with the title "Prepare to be Transformed". Will there be another Transformers computer game? - not until the 2007 Movie. Will we be getting all three coloured Spider Tanks (Ramble from Galaxy Force - was called Scrapmetal in TFCybertron)? - No. The orange version first, and maybe another colour later. The next event was Costume Contest in the Dealer Room, which can be seen on the Saturday Page or on the Art page. At noon was a repeat of the IDW panel, which was already covered on Friday at noon.